The Sorel choughs have had an ‘eventful’ month, no doubt further building their anticipation for release. Firstly they have witnessed a variety of impressive weather fronts. Mystical rolling sea fogs, scorching heat devoid of any cooling breeze, and some impressive thunderstorms. In an ‘exposed’ aviary such as the one at Sorel there is always the worry that the birds do not have enough appropriate shelter or shade. It helps that choughs are a hardy species. More importantly they are always being monitored by keepers and the aviary has been designed with shelter points in mind. A bit like dogs, birds will pant and stand open-mouthed when extremely hot. Fortunately without the slobbering. Extra drinking and bathing water was provided when necessary. The fog didn’t really cause any problems for the birds and the drop in humidity was probably a welcome relief. 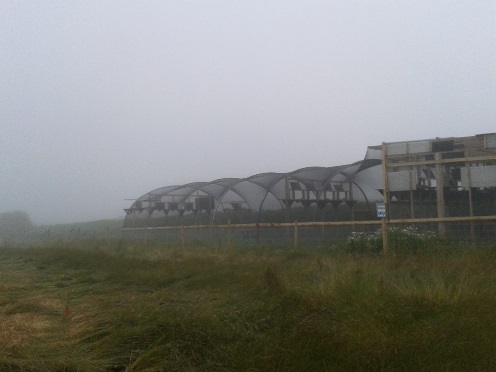 The birds may have also appreciated the blanket of secrecy provided by the fog as they had very few visitors. While the birds have had only a few non-human visitors besides dogs out on walks, there has, however, been an increase in rodent activity in and around the aviary. This was expected as the months go by and seasons change. 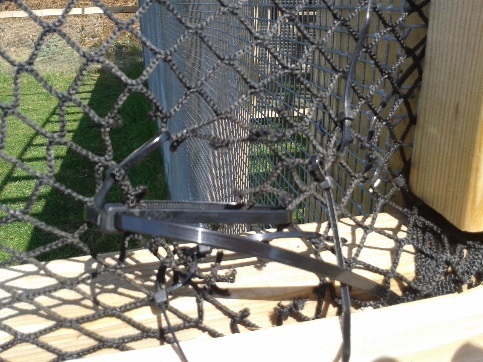 Something, most likely a field mouse, has been testing the durability of the aviary netting. In response to the rodent visitors, a specialised rodent-deterrent paint was applied to the netting around the perimeter of the aviary. The idea is that the rodent is put off from chewing because of the nasty taste. 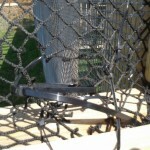 Normally the netting is pre-soaked before being used. Durrell has recently started testing the effectiveness and the aviary at Sorel became the most recent test subject. Unfortunately it appears Sorel mice do not object to the taste. On the plus side Sorel mice are not very adventurous/intuitive and have only focused on one tiny corner. Keepers seem to be winning this battle! The pair of peregrines that patrol the Sorel-Crabbé cliffs started moving inland towards the end of July. 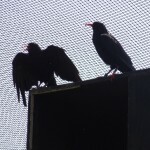 They have been spotted close the aviary on a few occasions, but don’t seem to show an interest in the choughs. Their presence is likely due to the increase in stock doves foraging in the neighbouring fields. As long as the peregrines have plenty of existing food resources we hope they will not need to add soon-to-be-released chough to their menu. On 9th July three of the choughs were caught up to look at their tail feathers and assess what stage of their moult they were at. We wanted to look at the three youngsters because one of them was the first to drop its radio transmitter, i.e. it had moulted the central tail feathers. The other two never had a transmitter and would, therefore, provide an interesting comparison. 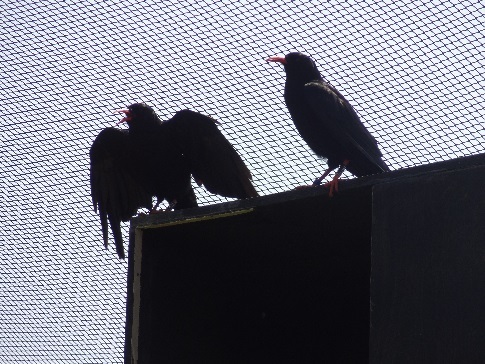 The chosen three were isolated from the group by calling them down for food and encouraging them into a section of the aviary sealed off by closing hatches. They were then caught in hand-nets by Durrell bird keepers who don’t work at Sorel (the choice of staff was to avoid any negative association the birds might develop if Sorel keepers were to do it). In the safety of the keeper porch a quick assessment of their moult score for tail and primary (wing) feathers was made. 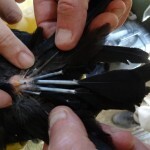 All choughs moult their tail feathers starting from the centre and working outwards. They start growing new tail feathers at the same time as their primaries (wing feathers) but complete the tail moult before the primaries are complete. All three of our choughs were at a similar stage in that only their central four tail feathers had started moulting. This meant that they definitely were not ready for new transmitters to be attached, but could well be in a few weeks. 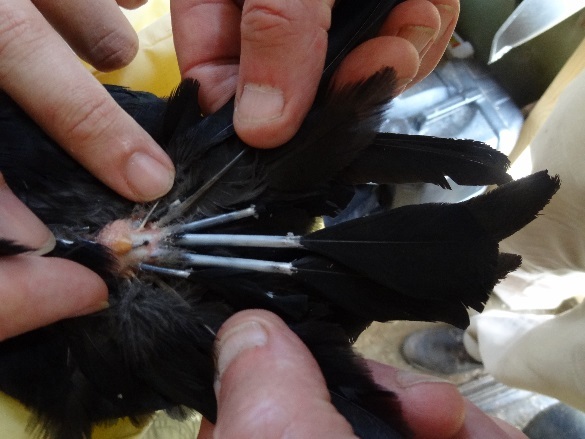 A second catch-up was carried out on the 26th when all the birds needed to be given an injection of ivomectin to protect against possible gapeworm infections. Due to timing constraints only four could be caught up. The remaining three were caught up on the 30th. In the first group, which happened to be all the older juveniles, only one was ready for a radio transmitter. The others were still moulting through the central tail feathers. From the second group, two were ready and had transmitters attached. The remaining birds without transmitters will be caught up again towards the end of August by which time they should have new, stronger, tail feathers. 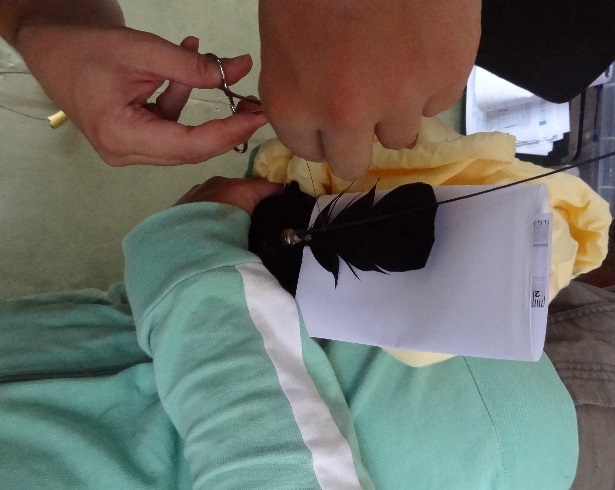 Whilst in the hand there was the opportunity for a quick general health check of feet, eyes and beak. All looked good and with no obvious sign of a gapeworm infection. There has been one female that developed a slight limp. Her leg was looked at but there was no sign of injury or bumblefoot and the vet was happy with her condition. After advertising through this website, via social media and on Channel TV we have managed to fill the positions for radio-tracking assistants. The team of three are all local to the Island and bring with them a range of skills and experiences beneficial to the project. Training will begin in August prior to the imminent release of the choughs. Jess Maxwell has had to finish her observations early due to other work commitments. We are trying to carry on with this study up until, and possibly after, the birds’ release. Myles Lamont, Durrell student, is helping out with these until he leaves to join Durrell’s Mauritius programme in mid-August. There have been several different activities going on at Sorel over the last month benefitting the BOTE project. At the start of the month the farmer and his team were out on the NTJ fields harvesting potatoes. This seemed to provide much entertainment for the choughs as they spent less time watching the coastline and more on the farm workers. My guess is they were eyeing up the soil for insects and probably became insanely jealous. Aaron, the shepherd (CS Conservation), has been very busy shearing the sheep which of course involves the onerous task of rounding them up first. The sheep range over both sides of Mourier Valley so the task takes several days and two very energetic Border collies. The choughs were a little on edge whenever a small flock of sheep would run past, but who wouldn’t be. On the whole, however, they paid little attention to what was going on. A team from the Government run Back to Work scheme spent several days erecting sheep fencing around the aviary and the field perimeter. Back to Work is a voluntary scheme for qualified jobseekers which aims to provide them with skills beneficial for the workplace. 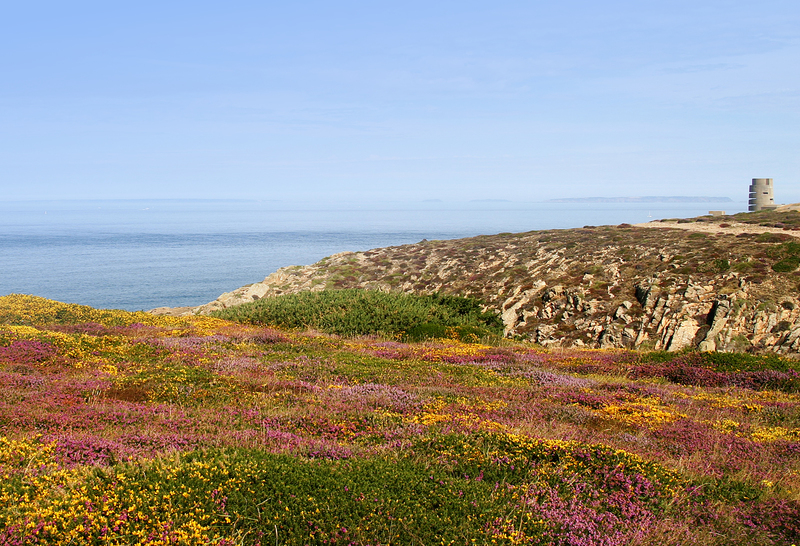 They teamed up with the National Trust to work on several conservation projects including this one at Sorel. The population of sheep at Sorel has grown over the years and they now need to expand their grazing sites. Now that this field has been securely fenced the sheep can be moved in when needs be. 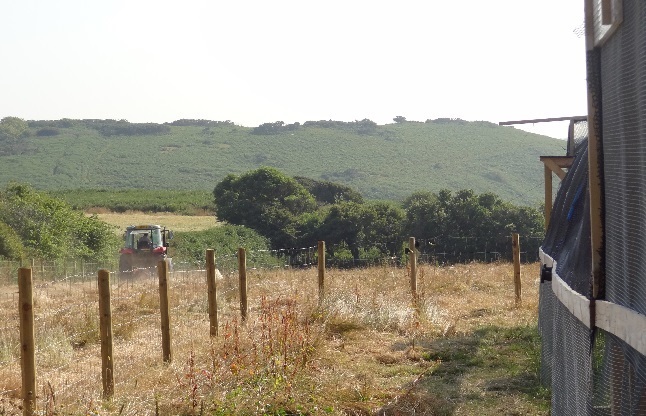 Once the fencing was in place Aaron set to work cutting back the dry, long grass. Great care was taken in using the tractor so close to the aviary. The design of the aviary allows the birds to ‘escape’ to either end depending on where the tractor/disturbance is. 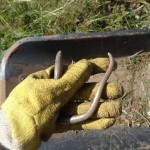 Once cut, a team of volunteers organised by the NTJ went up to the site and raked the cuttings into lines. This allowed Aaron to go back at a later date and quickly gather and remove the hay. On a less intensive scale, albeit very laborious, work has begun to remove bracken on the embankment that runs alongside the aviary. 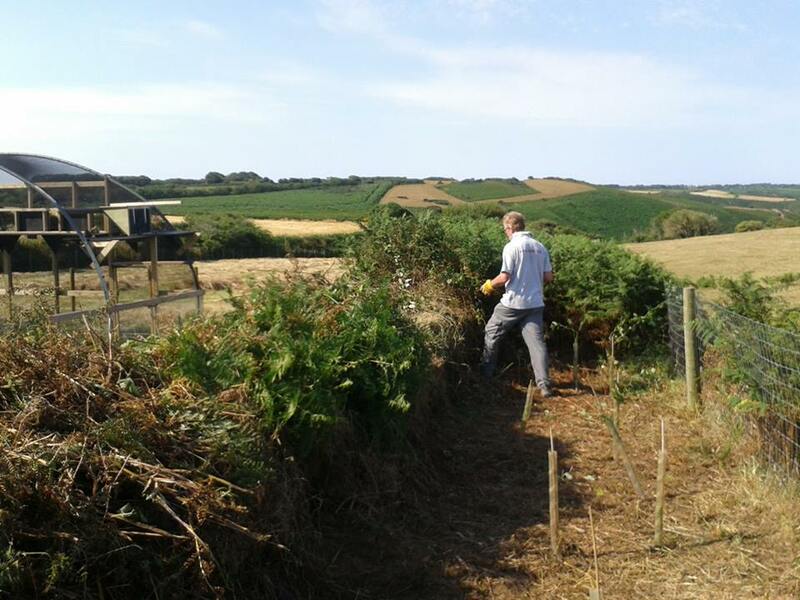 This will benefit the choughs in that more ground will be exposed for foraging and obstructions from in front of the release hatches have been removed to encourage bird movement back and forth. 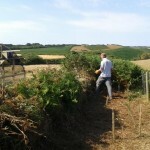 Neil Singleton, chough field assistant, kindly volunteered his time to help me pull out the bracken and stinging nettles. Due to the vast quantity of bracken, the green waste was taken off site and burnt on Durrell’s fire pit. 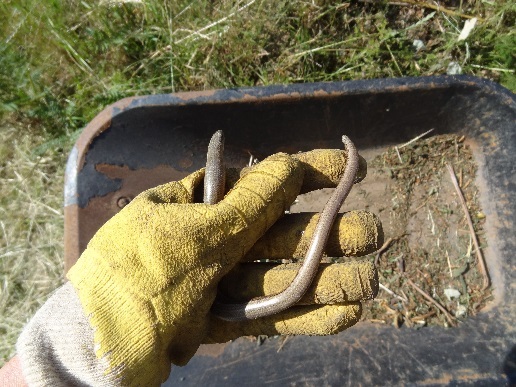 We have unearthed some interesting finds including a crapaud (a common toad for non-Jersey readers), a slow worm, and sadly a very dead green lizard. The removal of the bracken has also uncovered the hedgerow saplings planted in previous years by NTJ volunteers: a lot had suffered from being smothered by the bracken but some still stand firm and will hopefully continue growing. This work is ongoing.